We’ll begin with clarifying the meaning of waterproofing. No watch can be fully waterproof, the term “water proof” in selling watches has been illegal to say in the USA since the 1960s. “Water resistant” is the term that watch manufacturers use today and that can mean anything from a splash of water in the shower to a ocean dive of 100 meters. What we will explain here is how to make sure that watch (any watch, diver or not) lady’s or men, can be as water resistant as possible. 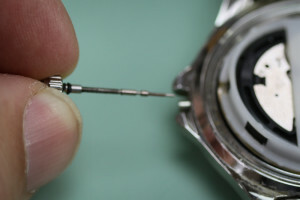 The watch manufacturer normally list on the dial (face) or on the back of the watch how deep a watch can be submerged in water. The figure they use can be in bars, meters, or feet. (3 BAR = 3 ATM = 30m = 100ft). This process would ensure that a regular watch will be just as water resistant as it was when it came out of the factory. We will continue to diver’s watches in the area below. 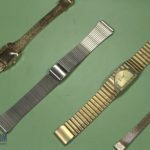 Let’s take a common everyday watch – Fossil, Guess, even Timex, and say that we replaced the battery and now we want to be sure that this watch will be as water tight as it possibly can be. Check the O-ring or gasket and replace if needed. We place the new or old gasket in the Gasket/O-Ring Lubricator, and leave it there while we continue with the watch inspection. Clean the back of the watch carefully, use q-tips with silicone, and make sure that both the watch back and watch case are free of any dirt or debris. 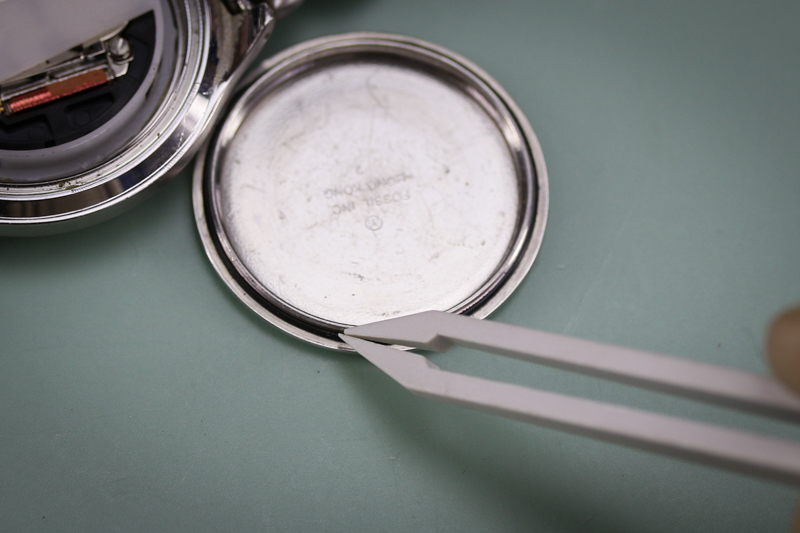 Remove the stem and crown, and clean the case tube ( if any) and the crown . If the crown is damaged, it needs to be replaced. Click for more help on removing and replacing the crown and stem. 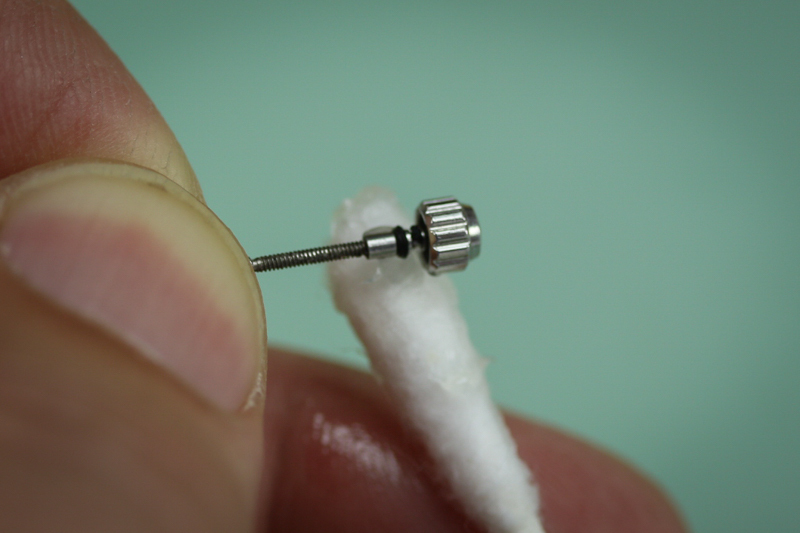 After cleaning the crown and the tube (the hole in the case), apply silicone in the crown and parts of the stem. Make sure that the stem and crown are back in place in the watch and are functional. 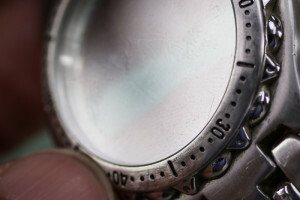 Clean the crystal of the watch and inspect. There should be no cracks or damage to the watch crystal, if any are found the watch crystal should be replaced. 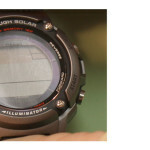 Click for more information on replacing watch crystals. Now that the crystal is either clean or new, get some epoxy, SUC Rocket cement, or G-S Crystal Glue and go carefully around the crystal and the case, applying glue on the edge. You only need to use a very small amount of this glue. 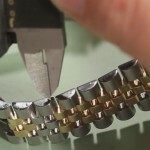 The purpose of this is only to seal little imperfections that either the crystal gasket or the existing crystal glue may have. Let it dry at room temperature. Now Remove the gasket from the Gasket/O-Ring Lubricator, the gasket or O-Ring should covered with silicone. Place it either in the groove of the case, or in the back of the watch. 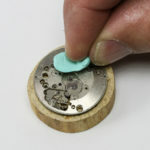 Set the watch and look for any glue or silicone left over and clean it. If everything is done as mentioned, a watch water resistant to 3 Bar would probably be resistant to 4 or 5 in control environmental A.K.A. Bergeon Waterproof Tester. Let’s define what a diver’s watch is and more important what makes diver’s watch (99% of Chronograph watches are not diver’s watches even though they are sold as if they were) The buttons on chronographs are very difficult to reseal so the more functions there are, the more places water can enter into the mechanism. So if you work on these watches, you should warn the customer that you can’t be responsible for water damage. Plastic watches, like Casio watches with a metal back and four screws, may be water resistant when they are sold, but when the battery is replaced, it is impossible to reset the screws with the right pressure and alongside this, the plastic case and metal screws are not a good combination because they can be stripped so easily. It becomes dramatically less water resistant after the battery has been changed, therefore you should not guarantee it will be water resistant after working on one. 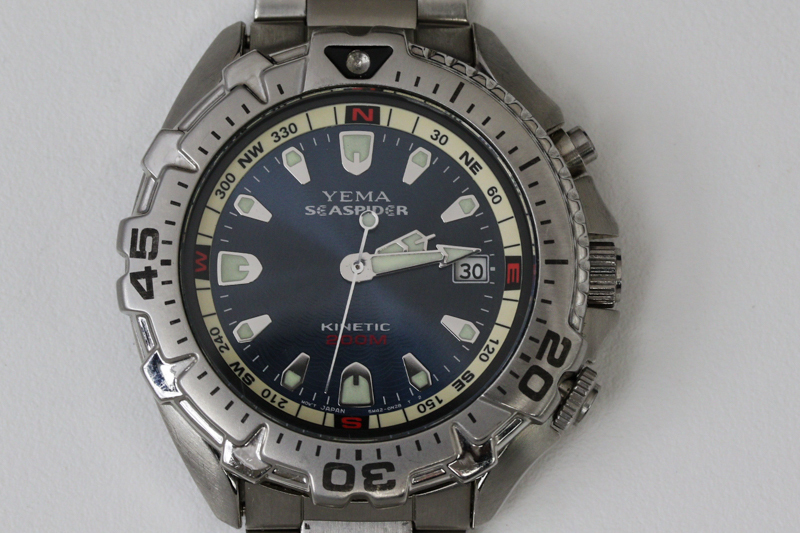 A diver’s watch should have no buttons other than the main crown. 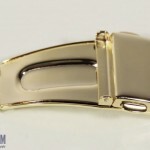 If it does have buttons, all of them should be the same type (threaded) as the crown and the back of the watch should also be a rotating screw on/off type for maximum water protection. 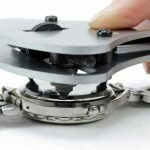 So in this example we are saying that you had to change the battery and reseal the watch to be just as good as when it was originally manufactured. The process is very similar as the process above; Everything needs to be checked and all the seals need to be opened and cleaned and lubricated with silicone. Also, all the gaskets should be check and potentially replaced. Most of the leaking and moisture in watches comes in through the area around the crown and the crystal – even more so in a diver’s watch. 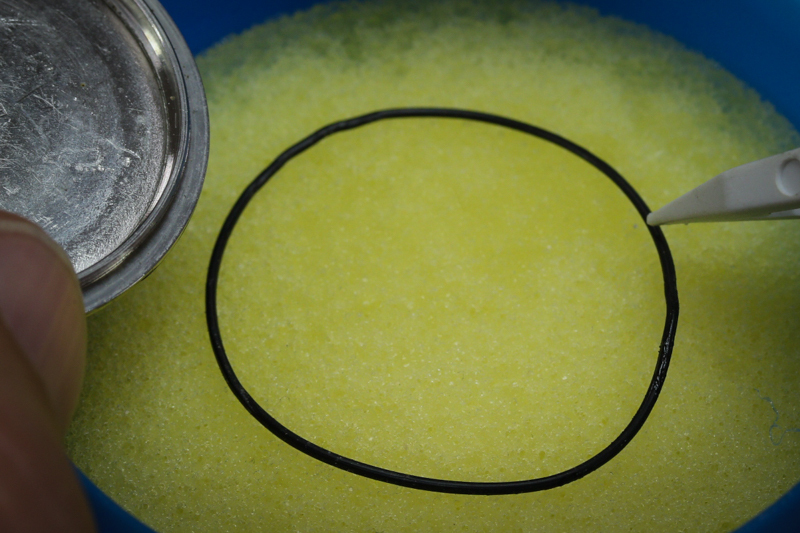 We need to make sure that the crown gaskets are in good condition, that the crown is screwed back in the tube, the gasket around the crystal is in good condition. 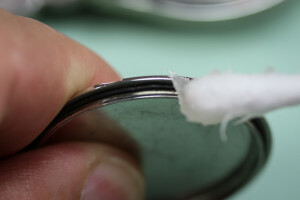 Some epoxy or glue can help fix little imperfections, but if the gasket is damaged, it definitely needs to be replaced. If you do everything explained above, a waterproof tester like the Bergeon Waterproof Tester tool should prove that the watch can keep out moisture under most circumstances. 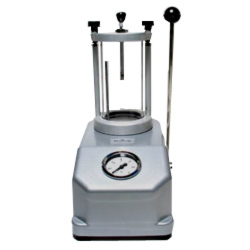 Using these tools can be a powerful sales tool to show customers that the watch can withstand (the limit) water pressure and give you a chance to educate them on the care of their timepiece. It is also something to prove that your work was done right and make sure that you do not get blamed for something that you were not responsible for. Thanks for the advise. 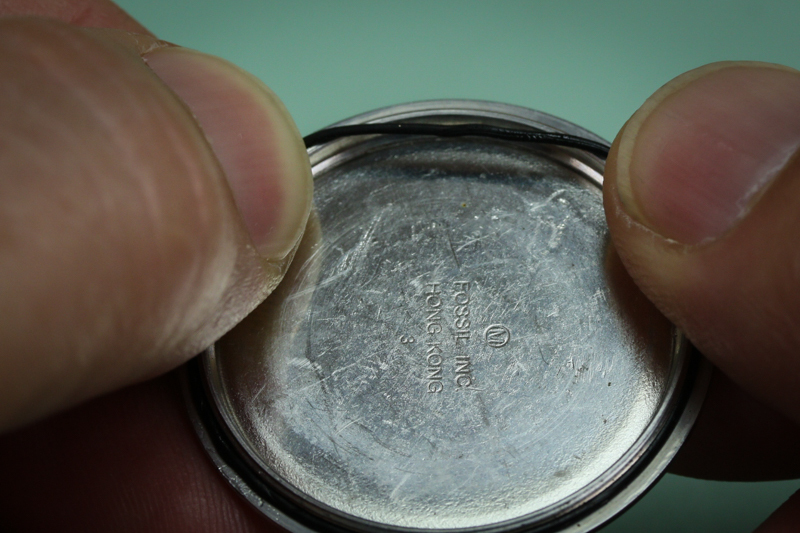 I’m just trying to replace the battery of my quartz Victorinox with 100 meter water resistant case. Would you expect to pay $30 to have this service performed by a jeweler? 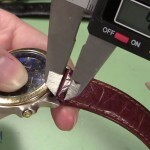 I think It could cost that much; it depends on the jeweler or watchmaker that you take it to and how many gaskets or other parts that need to be replaced or cleaned.